Health Care Reaching Amazonian Indians (April 2008) | Yanomami-Hilfe e.V. For three to five months every year, Christina Haverkamp lives with the Yanomami Indians in the Amazon Rain Forest. So far she has built 3 small medical stations for these people who previously had no access to health care. She also obtained a donation of insecticide-treated mosquito nets from Bayer Environmental Science to help control malaria, a major health threat to these very vulnerable people. The Yanomami Indians belong to the last remaining indigenous people in the world still living the same way they have done for thousands of years. They remained undiscovered and undisturbed until well into the 20th century. Probably never more than 20,000 to 30,000 in number, their habitat covers an area about the size of Switzerland, deep in the Amazon Rain Forest overlapping Brazil and Venezuela. Today, there are about 9000 Yanomami in Brazil and about 15,000 in Venezuela. But since the mid-1980s their survival has been severely threatened, not only by timber and mining industries and speculators buying up land, but particularly by the discovery of gold in this region. In addition to the ensuing destruction of the Yanomami’s natural habitat came the devastating effects of newly introduced diseases. As in any population, the Yanomami were previously not spared from diseases, the major burden being parasites. But incomers brought yet more diseases such as tuberculosis, measles and influenza, which the Yanomami had never been exposed to before, often with fatal consequences. Worse, when the gold diggers arrive they fell large tracts of forest to extract this metal from the soil, transforming the area into barren earth pitted with large pools of stagnant water. These muddy swamps are created when washing the extracted gold from the earth, and provide ideal breeding grounds for mosquitoes, the vectors for malaria. In the 1980s as many as 50,000 fortune hunters were illegally extracting gold in the Amazon Rain Forest. 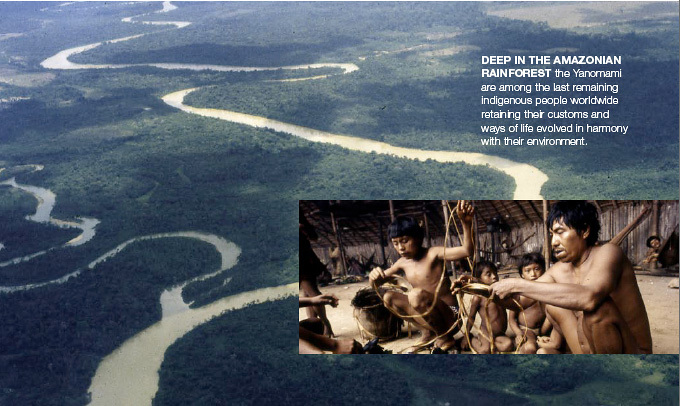 Since many of the gold diggers also had malaria, the disease soon spread to the Yanomami. By 1991, 80% of the 6000 surviving Yanomami in Brazil had malaria. For the last 17 years Christina Haverkamp from Nordhorn (Lower Saxony) in Germany has dedicated most of her time and energy to helping the Yanomami Indians in the Amazon Rain Forest. “The Yanomami have become my life’s work,” she says, as she describes her expeditions and actions to increase public awareness about these indigenous people and their fight for survival. For example, when she crossed the Atlantic on a home-made bamboo raft in 1992, together with the adventurer and human rights activist Rüdiger Nehberg. Planned to coincide with the 500-year anniversary celebrations of the New World, this spectacular expedition from Dakar (Senegal) to Brazil, then on to Washington and the White House aimed to spotlight the continuing suppression of indigenous American Indians. When not spending time with the Yanomami, Christina Haverkamp travels around Europe and America giving talks illustrated by slides, especially to schools. It is clear that the activist originally trained as a teacher when she vividly describes a unique world of customs and ways of life deep in the Rain Forest to fascinated school children and other audiences. Not only does this open people’s eyes to the problems facing these American Indians, she uses the donations and funds she collects from her arduous tours to bring health care to the Yanomami Indians. In 2006 she founded the charitable organization “Yanomami – Hilfe e.V.” to expand these activities. Following her first visit in 1990, she has repeatedly returned to Brazil bringing rucksacks full of medications to these people. Christina Haverkamp’s long-term goal was to build permanent medical stations for the Yanomami Indians in their own villages. The first medical station was completed in the village of Ixima in 1997. While the upper structure was made from wood and leaves, materials for the concrete and tiled lower part of the building were transported in by plane or boat. This was expensive, but important for the building’s stability and function. The Yanomami enthusiastically helped to build the small two-storey clinic, which includes a school, based on Haverkamp’s own design. “Unlike other medical stations, which heat up like an oven, I wanted it to be relatively open to let air circulate,” she says. In 2001, Haverkamp built a second medical station and school in Papiu Novo, previously a center for the gold diggers. Although political action has now reduced the number of gold diggers to one or two thousand, the burden of diseases remains. She was then approached by a doctor asking for her help to build a station in the Orinoko area in Venezuela. This third station in Mavaquita is the most remote medical care center in the world. Yet for many Yanomami people reaching a medical station still means many days traveling through the forest on foot or by boat. For this reason Haverkamp is still planning further medical stations in Venezuela, as well as completing the mobile station on a boat project. Once an infrastructure is set up, the Yanomami run the stations themselves, supported by the Brazilian or Venezuelan governments who pay for trained medical staff and supplies for these stations. The most important functions are providing vaccinations for children and early treatment of malaria. Eventually, the Yanomami should also carry out the medical treatments once they have gained the necessary skills. 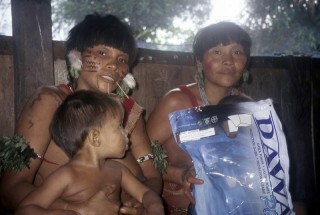 to providing the Yanomami with mosquito nets. Brazil did not allocate any money for nets so she contacted Bayer Environmental Science to ask for a donation of 2000 insecticide-treated nets. But these could not be “normal” bednets, since the Yanomami sleep in hammocks. So nets were customized in size and shape for use as hammock nets. These impregnated hammock nets were then delivered directly from manufacturers in Thailand and distributed with the help of Bayer Brazil and Yanomami representatives who have learned Portuguese. The first batch of nets was sent to the area of Rio Marauia and a second batch to Kayanau. A major aspect of distributing these nets is showing the Yanomami how to use them properly – having no tradition of using nets for malaria prevention, they also use them for fishing or as children’s toys. Over the years Christina Haverkamp has learned the Yanomami’s language, customs and traditions and gained their trust. Even the Shamans, the local healers, support the medical stations and modern methods, since they know they can do nothing against diseases such as tuberculosis, river blindness and malaria. “These diseases were brought in by us so we should be helping to treat them,” says Haverkamp. Now with the first batch of donated nets distributed she hopes to see an impact on malaria cases by close monitoring of hospital admissions. This entry was posted in Press, Supporters and tagged Amazon, Amazonia, expedition, indigen, indigenous, Malaria, medical station, medicine, mosquitonets, Orinoco, plane, raft, rainforest, river blindness, school, Venezuela on 1. September 2008 by Webmaster.